Everybody knows recycling is good in almost every aspect. Everyone is encouraged to recycle whatever junk they produce, especially when it comes to metals. Depending on the type and size, metals take 50 to 500 years to disintegrate entirely. You can’t just discard them and expect that they will disappear from sight after a few months or years. The only sensible way to get rid of metal waste is to recycle it. Thankfully, there are several recycling companies like JandSMetals.com that play a significant role in waste management, contributing to the goal of eliminating the need for landfills. The following are reasons for recycling that may sound like common knowledge, but still worth emphasising. Piles of junk metal can become a risk for people and animals. Large mounds of it may tumble and injure people. They can also serve as hiding and breeding places for dangerous animals, including insects, snakes, and vermin. Remember that metals take an extremely extended time to disintegrate, so abandoned large pieces of these unwanted objects can pose problems over a long time. Even smaller scraps can also be injurious. They must be properly disposed of. Recycling scrap metal kills two birds with one stone by addressing the problem of the eyesore of metal junk while preventing the unwanted effects of metal consumption on the environment. Abandoned metal products or scraps don't necessarily create direct problems in the ecology system. They are difficult to eliminate, but they don’t produce leaks or toxic substances that create considerable damage to habitats, plants, and animals. The main problems associated with them are injuries to animals or people caused by sharp edges and the space they take up. The primary benefit of metal recycling for the environment is the reduction of the need to mine more metals. The use of recycled metals reduces the demand for more metal ore mining, thereby alleviating the environmental burden of metal use. 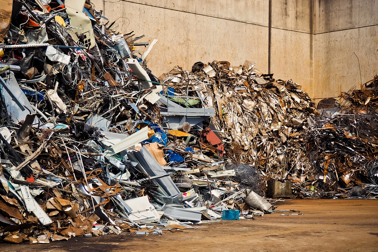 In addition to the environmental and eyesore-eliminating benefits, the recycling of discarded metals is also an excellent way to generate extra income. Scrap metals can be sold to recycling houses for a good amount of money. Imagine making some pounds by collecting tossed out objects. Doing this is a way of helping tidy up the community while making some money. You will not be making a steady stream of cash out of it, though, unless you formally turn it into an enterprising venture. Many have succeeded in the business of collecting and selling or buying and selling scrap metals. Copper can cost as much as £4.60 per kilo. You can sell stainless steel for £1.00 per kilo. Brass and lead, on the other hand, can be sold for £2.90 and £1.45, respectively. These are common objects thrown away by households, so if you make it a habit to collect them, you can make good money. It’s a no-brainer: metal recycling should be encouraged. Doing so creates benefits that don’t only benefit a few people. The recycling of junk metal is good for the environment and can serve as a source of extra income.